Dancing is now PROVEN as the BEST form of exercise for EVERYONE! All ages, all shapes and all sizes. No other activity can boast as many benefits as dancing. At DANCE GENERATION we believe that dancing isn’t actually about the steps – dancing is SO much more than just moving your feet to music! We place as much importance on the health, social and leisure benefits and opportunities that dancing can give people, as well as dance development itself and this sets us apart from many other dance schools. 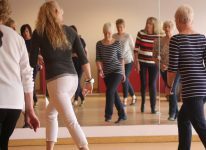 So, if you are looking for a dance school with professional, yet relaxed and patient teaching where you can learn to dance, but also have fun, make friends, get fitter and enhance your life skills – why not give us a try? We are members of the IDTA, which is the largest professional dance teaching association in the world and we were established in 1997. We would love to welcome you to any of our classes. ALL classes are FREE to try! Dancing – which has always been an essential part of the world’s culture, is as beneficial today as it’s always been. Everybody and anybody can dance. You’re never too young or too old to dance. Our bodies are designed to move, not sit around all day. We welcome everyone – all abilities and all ages ranging from four years to 94 years, any shape, any size, any level of fitness. Dancing is for EVERYBODY! Many of our current pupils have been dancing with us for over ten years which is testament to our success and commitment to continued improvement. Dancing is also good for the Spirit – we have seen many long-lasting friendships and bonds formed between pupils, young and old, who met at one of our classes during the years we have been teaching and we work hard to ensure that our classes are a positive experience as dancing is, and should be, fun for everyone! We have also heard countless reports of increased confidence that parents tell us they see in their children since they started dancing and ALL our dancers, regardless of age or ability, are treated equally. We want everyone to enjoy their dancing and look forward to their classes, so there is never any pressure to ‘get it right’ and we never judge or compare anyone – all we ask is that you try your best. We are passionate about dancing! 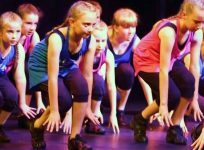 As a specialist dance school we are just focussed on dance – we don’t teach singing or acting like performing arts schools. Dancing is FUN! Not everybody wants to be a West End star (although if that’s what you want – we can teach you those skills too), so we simply want to share our passion for self expression, movement and music, through dance – with you. Dancing is now scientifically proven to be THE BEST form of exercise. 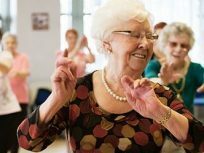 Apart from the well documented benefits to your health, such as increased strength, flexibility, balance and co-ordination, dancing can also reduce stress and boost feelings of well-being and happiness. Dancing also helps build confindence, it improves your memory, enhances your social skills and even keeps you young! And… it really is such a joy to dance…. BBC Documentary (2016) showing that dancing can help you live longer and stay young!